Cover Crops are grasses, legumes or forbs planted to provide seasonal soil cover on cropland when the soil would otherwise be bare. In Minnesota, the cover crop is commonly rye, although oats, barley, alfalfa, buckwheat and hairy vetch are also used. The short growing season in Minnesota limits the use of cover crops although use is expanding as farmers are seeing the environmental and financial benefits of the practice. Cover crops can be categorized into five main categories with winter cover crops and catch crops being the most commonly used. A winter cover crop is planted in late summer or fall to provide soil cover over winter. In Minnesota, winter cover crops arre commonly planted after potato harvest primarily to reduce wind erosion. A smother crop is a cover crop planted primarily to outcomptete weeds. In Minnesota, buckwheat and rye cover crops commonly serve this purpose. A green manure is a cover crop incorporated into the soil while still green to improve soil fertility. Currently in Minnesota, gree manures are used primaril by organic growers. Cover crops can serve as short-rotation forage crops when used for grazing or harvested as immature forace (green chop). Water quality befefits of cover crops come from three processes. The first is the literal cover that the crop provides the soil, reducing erosion from raindrop impact. The second is the potential for the cover crop to take up nutrients that would otherwise be lost from the field through surface or drainage water. The third is increasing soil infiltration. Nutrient management is the management of the amount, method, and timing of applications of fertilizers, manuer, and other soil amendments. The nutrients that have the greatest impact on water quality are nitrogen (N) and phosphorus (P). Nutrient management BMPs are one of the most effective ways to improve water quality because of the extent of nutrient related water quality issues. Nutrient Management is one of the most common BMPs used on farms state-wide and is recognized as a practice that can be implemented on almost every farm. Excess of both N and P can adversely affect our aquatic systems, driving new water quality standards and efforts to prevent further impairment of water bodies. N applied in agricultural fields poses a potential threat to human health when excessive levels of the nitrate form of N find their way into drinking water sources. Agricultural fertilizers are also a major contributor of nitrates to the Gulf of Mexico where they cause seasonal hypoxia. The keys to effective crop nutrient management are developming and following a yearly plan and conducting soil tests to determine the nutrient needs of crops. Increasingly, soil nitrate testing before applying fertilizer and plant tissue testing are used. It is essential to keep good records of the rate, method, and timing of all nutrient applications. It is also important to note the source of the nutrients, manure or other bio-solids, legumes, or irrigated water. Residual nutrients in the soil must be accounted for. Keeping good records help farmers compare expenses and returns from year to year. In short, good records provide solid information that helps farmers and crop consultants decide whether and how to adjust nutrient application rates, methods, and timing. Another important element of nutrient management is to consider the application rates recommended by private or public sector specialists. In 2006, the University of Minnesota Extension estimated that 86% of Minnesota farmers could save more than $6/acre and 56% could save more than $10/acre in fertilizer costs by following UM recommended rates. This was based on calculations by roughly 700 Minnesota farmers who prepared their own nutrient management plans at Extension workshops. "Organic" is a guarantee about how an agricultural food or fiber product was grown and handled before it reached the consumer. It's also a set of standards for farmers who grow plants and animals, and for processors and handelers who turn it into food for clothing products. Farmers and food processors that make organic claims must meet national organic standards, maintain carefull records, and be certified by an USDA accredited organization, a process that includes on-site inspections, however, farms that gross less than $5,000 in organic sales may be expempt from certification. The number of certified organic farms and acres in Minnesota is continuing to grow, along with the domestic and international market demand for organic food. Minnesota has more than 500 certified organic farms and more than 130 certified organic food processors and buisnesses. Organic continues to be one ofthe most rapidly growing sectors in the food industry. Benton SWCD has also identified an increase in the amount of interest from Benton County landowners. Pest management is utilizing environmentally sensitive prevention, avoidance, monitoring, and suppression strategies, to manage weeds, insects, dieseases, animals and other organisms (including invasive and non-invasive species), that directly or indirectly cause damage or annoyance. Use of pesticides to control crop pests is the first piece of pest management, although integrated pest management (IPM) is growing more popular. Integrated pest management is a set of strategies based on monitoring, economic thresholds and preventative tactics to determine if and when pest treatment is needed. Integrated pest management is more advanced than using pesticide alone for insect control, especially for fruit and vegetable production. This practice offers an incentive payment for up to three years for the management of invasive species up to 120 acres. Invasive species to be controlled include: European and Glossy Buckthorn, Multiflora Rose, Japanese Barberry, Honeysuckle, and more. Conservation tillage is any tillage practice that leaves additional residue on the soil surface for purposes of erosion control on agricultural fields. Many different variations of this common practice are imlemented, the specific variation selected is often based on climatic conditions and equipment available. Water quality improvements are due primarily to improved erosion control but conservation tillage can also protect water from nutrient pesticide losses. Residue Management with our office includes no-till, strip-till, and ridge-till. The residue management practice pays landowners an incentive payment for no more than 3 years to leave at least 30% residue on their crop fields. Residue levels are checked by SWCD or NRCS employees in the spring immediately after planting. Landowners may not sign up to receive their 3 years of incentive payments during the first year to assist with purchasing tillage equipment that has the ability to leave 30% residue on the soil surface. Nutrient Management (Ag BMP) Demonstration Plots are used to evaluate management strategies. A small strip of cropland is normally used to evaluate the University of Minnesota's nutrient recommendations against the producer's normal management strategies. Nutrient management demonstration plots can be planned for anyone needing to perform nutrient management. Up to two soil tests are paid for each set of plots. The soil test is for phosphorus (P), potassium (K), pH, and organic matter. Mid-season leaf samples are collected and analyzed for nutrient content and paid for each plot. Incentive Bonuses of $150 per plot are offered. Manure testing is paid for through a grant and includes analysis of nitrogen (N), phosphorus (P), and potassium (K). Manure spreader calibrations are offered free of charge. Feedlot runoff control is a system of structures and practices that reduce runoff and protect water bodies from nutrients and bacteria. The system is composed of collection, storage, and treatment of livestock manure and feed waste as well as diversion of clean runoff water away from the feed lot area. This also helps to conserve nutrient-rich manure and enhance livestock health as part of a complete runoff control system that results in clean, dry lots. Best management practices include feedlot/wastewater filter strips and clean runoff water diversions. Clean runoff water diversion involves a channel constructed across the slope to prevent rainwater from entering the feedlot area or the farmstead to reduce water pollution. Feedlot/wastewater filter strips are areas of vegetation that receive and reduce sediment, nutrients, and pathogens in discharge from a settling basin or the feedlot itself. Rotational Grazing, also called prescribed or managed grazing, is a management-intensive system of raising livestock on subdivided pastures called paddocks. Livestock are regularly rotated to fresh paddocks at the right time to prevent overgrazing and optimize grass growth. A rotational grazing system is an alternative to continuous grazing in which a one-pasture system is used that allows livestock unrestricted access to the entire pasture throughout the grazing season. Animal rotations can vary from a simple rotational grazing system in which animals move or rotate to a fresh paddock every 3 to 6 days, to an intensive rotational grazing system in which animals are moved to a fresh paddock as frequently as every 12 hours. Grazing is started when forage is about 8 inches tall and stopped once it is grazed down to about 4 inches tall (depending on vegetation type). The means less need to feed hay, silage or grain. Following the grazing period the paddock (pasture) is rested for approximately 30 days (depending on the weather and productivity of the pasture). This provides a recovery time to maintain forage plants in a healthy and vigorous condition. The primary benefit of rotational grazing to the producer is a more efficient and productive pasture allowing for increased carrying capacity, longer stays on pasture, resulting in less need to feed hay, silage or grain. Typically in Minnesota, cattle are grazed in marginal farmland - wet areas and stream valleys. Uplands are reserved for corn and soybeans. Fencing, pipeline, watering tanks, heavy use area protection, and pasture seeding are all practices that are eligible for cost-share payments through the Environmental Quality Incentives Program (EQIP). Prescribed grazing plans are completed by the SWCD and NRCS office. Manure management planning ensures careful handling and use of livestock manure to obtain its full value as a crop nutrient while protecting water and air quality. Manure management plans describe how manure generated at a feedlot will be used in upcoming cropping years. Plans typically specify nutrient rate limits and setback distances for applying manure near lakes, streams, wetlands, drainage ditches, open tile intakes, sinkholes, wells, mines and quarries. Once a manure management plan is developed, following the plan often involves using specially designed facilities and technologies to store, process and transport manure securely and special techniques for applying manure to cropland. Minnesota's feedlot rule (Minn. R. part 7020.2225) and some local county ordinances require developing and following a manure management plan in certain circumstances. Additional manure management activities required for many livestock operations (and recommended for all) include keeping manure application records, testing manure for nitrogen and phosphorus content and testing soils for phosphorus. Waste storage facilities are impoundments created by excavating earth or structures constructed to hold and provide treatment to agricultural waste. They may be used to hold and treat waste directly from animal operations, process wastewater, or contaminated runoff. Leaking storage facilities (also termed lagoons) have the potential to negatively impact lakes, rivers, and streams. Key design considerations should include length of storage and accounting for weather limitations during application or disposal. Other considerations include the equipment available for transfer and/or spreading as well as crop and soil types. A grade control structure is used to control the grade and head cutting in natural or artificial channels. The purpose of these structures is to stabilize the grade and control erosion in natural or artificial channels, with a combination of earth embankments, mechanical spillways and full-flow or detention-type structures. Water and sediment control basins (WASCOBs) consist of an embankment across the slope of a field or minor waterway to temporarily detain and release water through a piped outlet or through infiltration. They are constructed perpendicular to the flow direction and parallel to each other. WASCOBs are usually installed in areas where the land is relatively steep and undulating. WASCOBs are used to improve the ability to farm sloped land and to reduce erosion on farmland and waterways. They are useful in managing hydrology by controlling downstream flow rates, thereby reducing erosion. A buffer of permanent vegetation surrounding risers can help to filter sediment and pollutants. Similarly, a sediment basin is a basin constructed with an engineered outlet, formed by excavation or use of an embankment, or a combination of the two. A sediment basin may also be utilized for the purpose of nutrient removal. A sediment basin functions by detaining sediment or nutrient-laden water for sufficient time to attain a desired level of treatment. Sediment basins may be used in agricultural or urban locales and are used to treat water from disturbed areas or construction sites, either on a temporary or a permanent basis. Field windbreaks are linear plantings of trees/shrubs designed to reduce wind speed in open fields, preventing soil erosion and protecting adjacent crops from wind damage. Windbreaks are typically planted in multiple rows perpendicular to prevailing winds. On the downwind side of a well-established windbreak, wind is generally slowed for a distance of 10 times the height of the trees. Old field windbreaks may need renovation to function properly, including removal and replacement of selected trees/shrubs. Shelterbelts are windbreaks designed to protect farmsteads and livestock from wind and blowing snow. They can also be used to protect wildlife wintering areas. One or more rows of trees/shrubs are planted around the north and west sides of a farmstead or feedlot, surrounding it partly (often in an L-shape) or more completely, like a squarish belt. Shelterbelts protect farmsteads and livestock from blowing wind and also save energy. Living snow fences, a type of windbreak, are trees/shrubs planted strategically along roads to trap snow and keep it from blowing and drifting on roads or driveways. Old living snow fences may need renovation, including removal and replacement of selected trees/shrubs, to continue working properly. The Benton Soil and Water Conservation District (SWCD) received an Accelerated Implementation Grant in 2014 for the continuation on the Little Rock Creek Irrigation Management. This grant is a combination of efforts from Benton and Morrison SWCDs to address irrigation water management in the Little Rock Creek Groundwater recharge area. The Little Rock Creek Total Maximum Daily Load(TMDL) Study has revealed that a majority of the impairments are linked to altered flow (hydrology). Specifically changes in groundwater flow during the summer months are changing groundwater inputs to Little Rock Creek, which is having a negative effect on the fish communities. This grant provides technical assistance for landowners who want to implement irrigation “catch can” tests on their fields to check the uniformity and efficiency of their irrigation systems. Each "catch can" test performed on an irrigation system is offered free of charge through the 2014 Accelerated Implementation Grant. Producers who wish to convert their irrigation system from high pressure to low pressure or are interested in irrigation water management may be eligible for financial assistance from the Environmental Quality Incentives Program (EQIP) through the Natural Resources Conservation Service (NRCS). In 2011, Benton SWCD, in the interest of sound irrigation management and water management, constructed an “irrigation Scheduler Program.” This program is designed to provide the farmer with a second opinion on in-fields soil moisture status to assist the farmer In determining if and when to irrigate. Accurate water application can prevent crop loss due to insufficient moisture, prevent groundwater contamination due to over application of water used during some parts of the growing season. This program is free of charge to landowners in the Little Rock Creek Recharge area and Benton County. Please contact the Benton SWCD or Morrison SWCD if you are interested in learning more about the incentive program for “catch can” tests, irrigation water management, or low pressure pivot conversions. Riparian vegetation is a mix of grasses, forbs, sedges, and other vegetation that serves as an intermediate zone between upland and aquatic environments. This vegetation is often used to stabilize streambanks. Riparian buffers can improve water quality by acting as a filter strip that induces sedimentation and anchors soil through its root system. Buffers can also be play an important role in providing habitat, helping to regulate water body temperature through shade and can help to dissipate stream energy. If receiving runoff from upland sources, riparian vegetation has similar water quality benefits to vegetative filters. Riparian buffers can improve water quality by promoting sedimentation of sediment and associated pollutants, as well as nitrates. An unused well can act as a drain, allowing surface runoff, polluted water and improperly disposed-of solid or other waste to contaminate groundwater. Therefore, sealing abandoned wells protects groundwater quality. Old unused wells can be hard to find. They may be buried under soil or covered by buildings. Sometimes the only evidence is a depression or an old well casing close to a house or outbuilding. Hand-dug wells can be safety hazards for children, adults, and animals to fall into as well. Visit the Minnesota Department of Health's website for tips on finding abandoned well sites on rural land. State Cost-Share offers 50% cost-share rates to seal unused wells in Benton County, up to $1,000. Please contact our office if you would like more information. The Benton Soil & Water Conservation District has various cost-share programs available for landowners to repair/replace failing septic systems. The purpose of these programs are to promote public health and welfare by preventing, reducing, and eliminating water pollution. For a brochure on all the available programs for failing septic systems, click here. These funds are available to landowners who have their septic systems inspected by a licensed private inspector and the system has been deemed to be an Imminent Threat to Public Health and Safety, and a Notice of Noncompliance has been issued. Landowners could be eligible to be reimbursed up to 50% of the installation costs to repair/replace a failing septic system, which are paid after completion. Landowners are responsible for any inspection and design fees, along with any permit costs. At a minimum, a system that is an Imminent Threat to Public Health and Safety is a system with a discharge of sewage or sewage effluent to the ground surface, drainage systems, ditches, storm water drains, or direct to surface water; systems that cause a reoccurring sewage backup into a dwelling or other establishment; systems with electrical hazards; or sewage tanks with unsecured, damaged, or weak maintenance hole covers. For more information on the programs above, click here. Benton SWCD is administering this Clean Water Fund grant on behalf of Benton County. This program is available for Benton County residences who have a homesteaded, single-family home who meet the income criteria and other program eligibility requirements. Provides cost-share for failing septic systems that have been inspected by a licensed private inspector and the system has been deemed to be 1) Imminent Threat to Public Health and Safety OR Failing to Protect Groundwater, and 2) Notice of Noncompliance has been issued. Combined household gross annual income must qualify under the USDA Rural Development Low Income Guidelines (INCOME TABLE is on application). There are two cost-share rates available and are depended on combined household gross annual income. Cost-share rates are 1) up to 75% not to exceed $10,000 OR 2) up to 50% not to exceed $6,500. Cost-share rates depend on which income table the household is eligible for. See Application for all the program criteria and eligibility requirements. For more information & program application, click here. Habitat restoration and management preserves natural upland or wetland ecosystems and the plants and animals that thrive there. It typically involves permanent, perennial grass/shrub/tree plantings suitable for desired wildlife. Long-term management is needed to maintain the desired habitat and keep out invasive species. 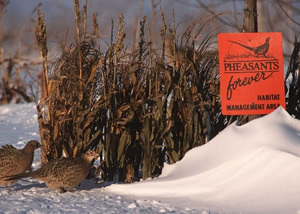 Common elements of habitat restoration in Minnesota include wildlife travel corridors, wildlife habitat buffers, wildlife food plots, wildlife brush piles, bird nesting structures and forest openings. Wildlife habitat corridors connect isolated patches of habitat. They can be man-made ribbons of habitat or formed around natural features such as streams. Trees/shrubs with a high density of stems are ideal for wildlife corridors. Corridors must be wide enough to provide cover for larger wildlife and allow them to move freely. Riparian buffers and filter strips being established for water quality purposes can be designed to double as wildlife corridors. 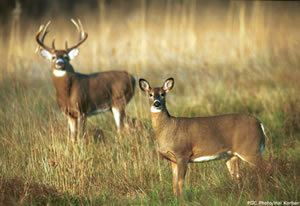 Wildlife food plots are small tracts of crops left unharvested to provide food and cover for a variety of wildlife. They are particularly important as a dependable source of winter food. Many conservation programs encourage wildlife food plots although food plot acreage is usually ineligible for cost share or rental payments. Wildlife brush piles provide shelter for small mammals such as red fox woodchucks, weasels, skunks and chipmunks as well as garter snakes, salamanders and more, including numerous bird species. Good sites for wildlife brush piles are along forest roads and edges, in woodland openings, at field edges and corners, and beside streams and wetlands. Controlled burning is the intentional periodic use of fire to manage perennial vegetation. It is one of several types of disturbance (such as mowing, clipping or grazing grassland) that invigorate plant roots, improving the health of the stand as new vegetation emerges. Trained professionals burn specific areas of vegetation to meet various management goals such as maintaining a desired ecosystem, controlling invasive species and improving wildlife habitat. Wetland Restoration re-establishes or repairs the hydrology, plant communities and soils of a former or degraded wetland that has been drained, farmed or otherwise modified since European settlement. The goal is to closely approximate the original wetland’s natural hydrologic regime and vegetation, resulting in multiple environmental benefits. Restoring wetland hydrology typically involves breaking drainage tile lines, building a dike or embankment to retain water and/or installing adjustable outlets to regulate water levels. Restored wetland plants usually include a mix of native water-loving grasses, sedges, rushes and forbs (broad-leaved flowering plants) in the basin or ponded area and a mix of native grasses and forbs in upland buffers around the basin. Restored prairie pothole wetlands provide breeding grounds for ducks, geese and other migratory waterfowl whose habitat has been greatly reduced. Constructed wetlands, sometimes called treatment wetlands, are man-made systems engineered to approximate the water-cleansing process of natural wetlands. In agriculture, constructed wetlands are used to filter runoff from cropland, feedlots, aquaculture operations and agricultural-processing facilities. 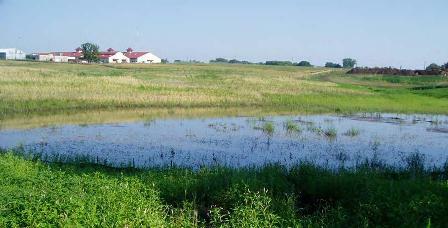 Constructed wetlands can also provide habitat for some waterfowl, other birds, amphibians and invertebrates.